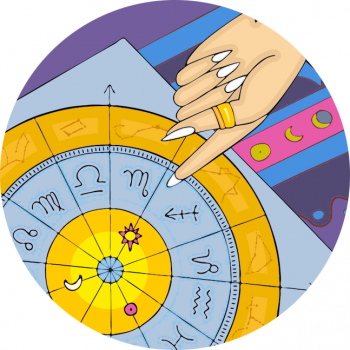 Traditional horoscopes focus on a person’s Sun sign – that’s the star sign you’ll find in newspapers or online, which relates to where the Sun was when you were born. But did you know that all the heavenly bodies in our solar system have an effect on our personality? Here you’ll find an overview of the planets in astrology, and their meaning in your natal chart. Select a particular planet to read more and enjoy learning about the zodiac with Star Sign Studies! The Sun, Moon, Mercury, Venus and Mars are all personal planets, they’re known as highly influential on our character and motivations. The ‘outer planets’ or ‘generational planets’ are slow moving, so a collective generation will all have the same zodiac sign of these planets, although in very different placements in their birth chart. The sun is the brightest star in the sky, and governs our sense of purpose and our outward ego. We usually strongly identify with our sun sign, which drives us and lights us up! Our sun sign says something about the way we operate in the world, and we’ll often find ourselves dressing with traits of the season of our birth. The moon reflects the light of the sun, and is mysteriously linked to major cycles and our tides. Our moon sign is our internal nature; it’s our personality once people have gotten to know us and are in our circle of trust. It’s our everyday behaviour at home or at work, and resonates with what emotionally feed us. Mercury is the planet of communication, thought and connections, and indicates the style we’re likely to communicate in, our state of mind and how we naturally process information. It’s the way we think, talk, and what we’re likely to talk about. The winged messenger, Mercury carries the sentiment of the ‘King’, and closely follows the path of the sun. Venus is the planet of love, beauty and feminine seduction. Venus guides our romantic inclinations, how we behave as a woman, and is an indicator of how we love, and feel about being close to people. Venus represents flirting and the dance of romance, including how we make ourselves attractive (fashion styles included!) It also represents money and spending. Discover beauty planet Venus with descriptions of each Venus sign! Mars is the aggressive, passionate planet of war. It can indicate our driving forces and what we’re willing to fight for – it’s how we assert ourselves. Mars also represents the energies of hunting and chasing a sexual conquest. It can indicate the qualities a woman might be attracted to in a man… Where Mars appears in our charts can reveal a lot about how we deal with conflict and our own anger. Discover the biggest planet, Jupiter, which guides our growth and expansion!